We’re at the world launch of Triumph’s new Explorer. We get to ride the all-singing off-road (XCA) version tomorrow, but tonight Triumph are letting us know what makes the new bike tick. The new machine has an impressive array of new electronics from riding modes, to cornering ABS, IMU-powered traction control and semi-active suspension. The new Euro4-tweaked motor has more 2bhp power, 2flb more torque and is 5% more frugal. But away from the peak figures the 1215cc inline three cylinder engine has 6% more torque at 5500rpm and more grunt all the way through the rev range. It has sharper steering, better comfort, revised styling, beefier Brembo monoblocs and an electronically operated screen, which should banish the wind buffeting problems found on the old machine. 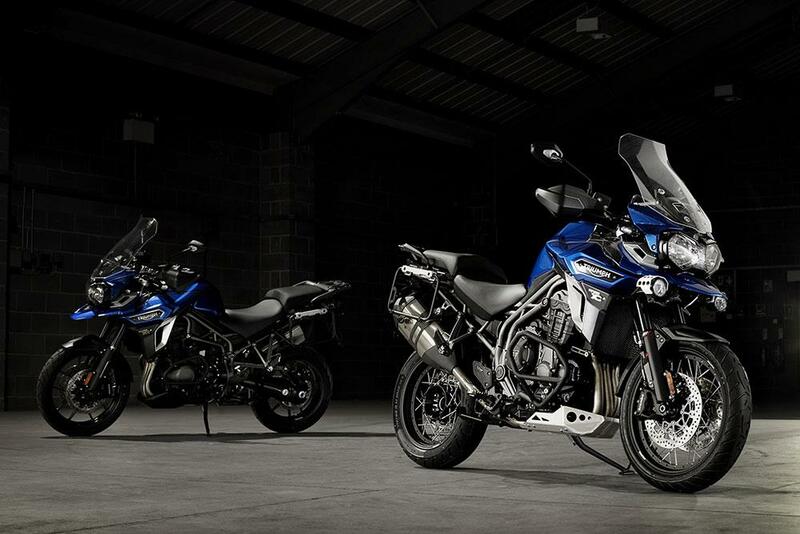 Depending on which of the six Explorer versions you go for - split into three road (XR) and three off-road (XC) - there are toys aplenty from cruise control, a hill hold control, heated grips, heated seat, cruise control, USB and 12v chargers…the list goes on. Plus there’s over 50 official Triumph accessories and a low Explorer version which is a useful 52mm lower.